Do Fleas Fly & Do They Have Wings? ​​Can Fleas Fly & Do They Have Wings? Fleas are certainly an unpleasant and distressing issue for any homeowner to deal with. Large infestations of fleas can seemingly appear out of nowhere, leaving you and your pets itching and scratching like crazy. The most common question on anyone's mind is how on earth did they get here? 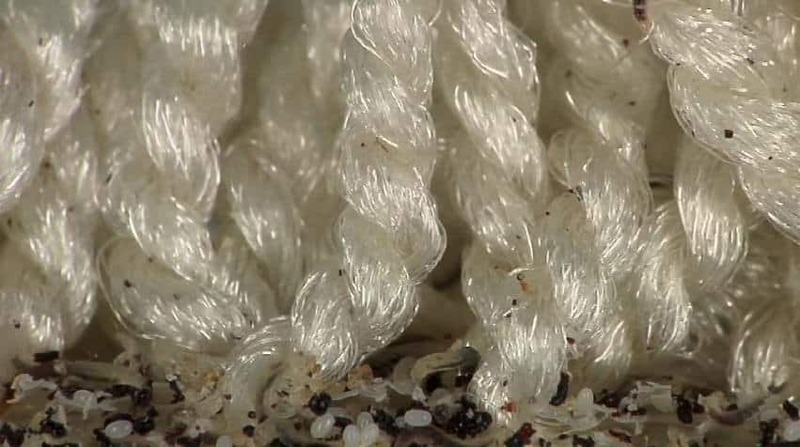 Fleas seem to manage to find their way onto your pet, furnishings, your clothes and maybe even your bed. For such tiny creatures, this understandably leads many people to believe that fleas are capable of flight. But are they? This article takes an in-depth look to find out whether fleas can fly or not. Are Fleas Able to Fly at All? How Do Fleas Get in the Home? Fleas do not have wings. In fact, the scientific name for the order of insects they belong to translates directly as wingless. The vast majority of parasitic insects like fleas, ticks, and bedbugs do not have wings. Instead, they access their hosts from the ground. Even though fleas are without wings now, scientists believe that they originally descended from winged insects which existed millions of years ago. At this time, fleas are known to have been parasites of prehistoric mammals, much like today. Fleas have been in existence for at least 60 million years, adapting and evolving over millenia. These prehistoric fleas lost their wings when they became an inconvenience to remaining on a furry host. Wings were not streamlined enough to efficiently move through an animal coat. Once fleas became resident parasites which remained on a host for their entire lives, wings were a useless handicap, so they were discarded through evolution. Fleas may have lost their wings, but they do retain many anatomical structures which flying insects possess. The most important of these is what is known as a pleural arch. This arch is essentially a hinge ligament for a wing. It contains a protein which is very elasticated, called resillin. This acts like a rubber band, storing up energy for the flea to leap. Due to their lack of wings, fleas cannot fly. Fleas can appear to be flying when they leap through the air, covering large distances relative to their size. They have specially adapted bodily structures which enable them to jump so high and far when compared to other flightless insects. Examining the structure of a flea leg is the best way to appreciate their flying leap skills. 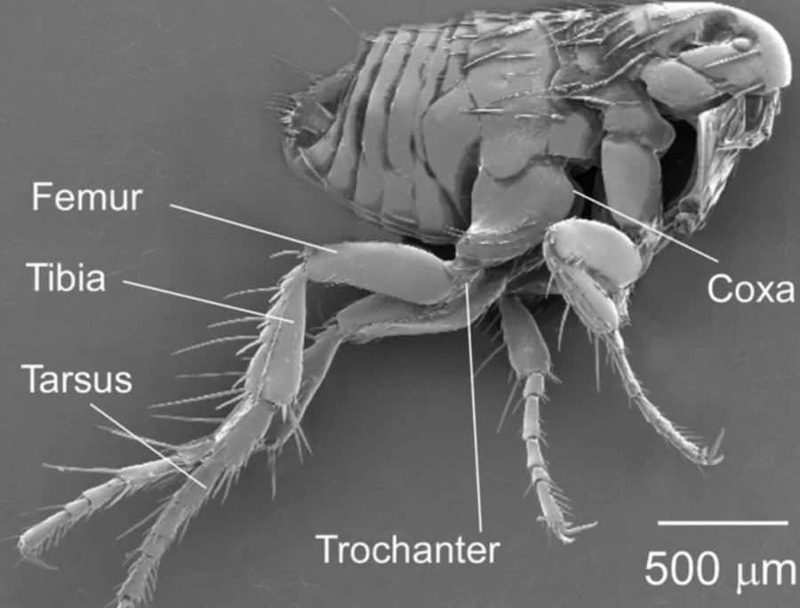 The leg of a flea is made up of four different sections or segments. They extend outwards from the main body, and consist of a coxa, femur, tibia, and tarsus. The coxa is the very first section of the leg which is directly attached to the body. The femur is the thickest section, containing dense muscles. This connects to the trochanter, which is essentially the knee, and the tibia. This tibia connects to the tarsi, or feet of the flea. When flea jumps have been studied, it was initially a surprise to find that the trochanter, or knee, of the flea touched the floor moments before a leap. Researchers then believed that the trochanter played a key role in propelling the flea into the air. However, in modern times, research has found that the tarsi, or feet, of a flea are more important to a flea jump than the trochanter. Fleas are able to utilize about 100 times the power of their leg muscles by using the energy stored in the elastic resilin in their pleural arch. Both of their legs always fire at exactly the same moment, allowing them to perform incredible leaps. The resilin protein is strong and flexible, like a rubber band. It stretches and then snaps back, propelling the flea into the air. It effectively returns to its original size and shape upon landing, without losing any elasticity. Studies have found that cat fleas are able to leap an average of 8 inches horizontally. The farthest leap recorded from a group of 450 cat fleas was an incredible 19 inches. Because cat fleas are only about ⅛ inch long, this distance is 180 times the length of the flea. It is hard to imagine a mammal leaping that far! In terms of height, fleas have been found to be able to leap a maximum of 7.9 inches high. Half of the fleas studied only managed just over 5 inches in height. Therefore, fleas can leap farther in length than in height. Furthermore, the leap of a flea is very energy efficient due to their anatomical design. Such powerful leaps require less energy than that consumed by flying insects. However, the legs aren't usually strong enough to remove fleas from a particularly sticky situation, such as getting stuck in a flea trap. Fleas use these amazing jumping skills to reach their hosts from the ground when they emerge from their pupal cocoons. Once they perceive a host passing by, usually from differences in light and shadows, they will leap towards it. They extend their middle pair of legs out towards the target, to grasp at the fur upon landing. Fleas are extremely successful parasites due to their skills at reaching hosts with powerful leaps. They have managed to combine the ability to cover large distances, like flying insects, but without the inconvenience of wings and wing cases. Their bodies are also flattened to help them quickly move through the fur of a host. Such a flattened body is not conducive to wings, so the flea is a very unique creature in design. Different kinds of fleas will move in their own preferred ways, depending upon the host environment. Fleas are incredibly well-adapted to life upon the host which they have evolved alongside. A good example of this is the cat flea, which is adept at scurrying through dense fur and avoiding being groomed away by the host. Adult fleas aim to spend their entire life upon the host once they have reached it. From this moment on, fleas tend not to leap about; instead, they will walk or crawl about the host for the rest of their days. Fleas can also climb, but they don’t tend to do this very often. Once a flea has emerged from its pupae, it must reach the surface from wherever it has hidden itself. Outdoors, this will usually be in the top layer of soil or close to the roots of grass. The newly hatched young adult flea will climb to the top of a blade of grass, or the top of carpet fibers to wait for a host to come past. The most common way that fleas gain access to your home is via a household pet. Fleas always originate outdoors, developing in damp, shaded, and well sheltered areas. At the final stage of their life cycle, the adult flea hatches from the pupae and hops aboard a host, usually an unsuspecting pet dog or cat. The fleas will immediately start to feed and will begin breeding shortly afterwards. 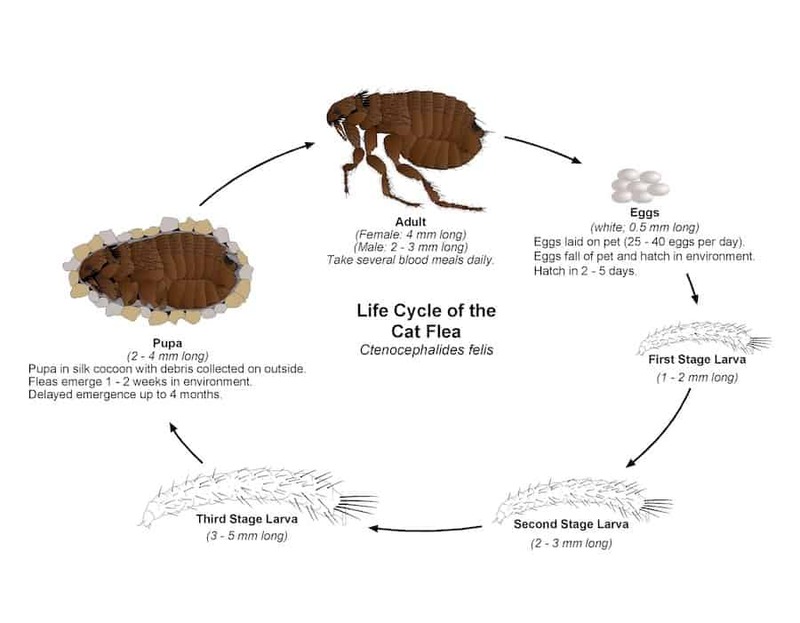 Eggs laid by female fleas are designed to be shed from the host within a few hours of being deposited. Your poor pet essentially distributes these eggs everywhere they go, much like a disgusting salt shaker. The eggs will usually fall into the dense fibers of your carpet, but can also topple into cracks in wooden or stone flooring. This is where they will remain throughout their larval and pupal stages, before emerging as a nasty surprise a few weeks later. If you do not have pets in the home, it is not impossible for fleas to enter your home via wild or stray animals. Creatures such as feral cats, rats, raccoons, and mice can get into your home via an open window or door, looking for food. Also, if you have garage space or attics which are not completely secured against animals, they may access these areas for shelter, or to have their young. It is also possible that you are responsible for bringing fleas into your home. Simply parking your car in a place where fleas are lurking is enough to gain an unwanted passenger home with you. 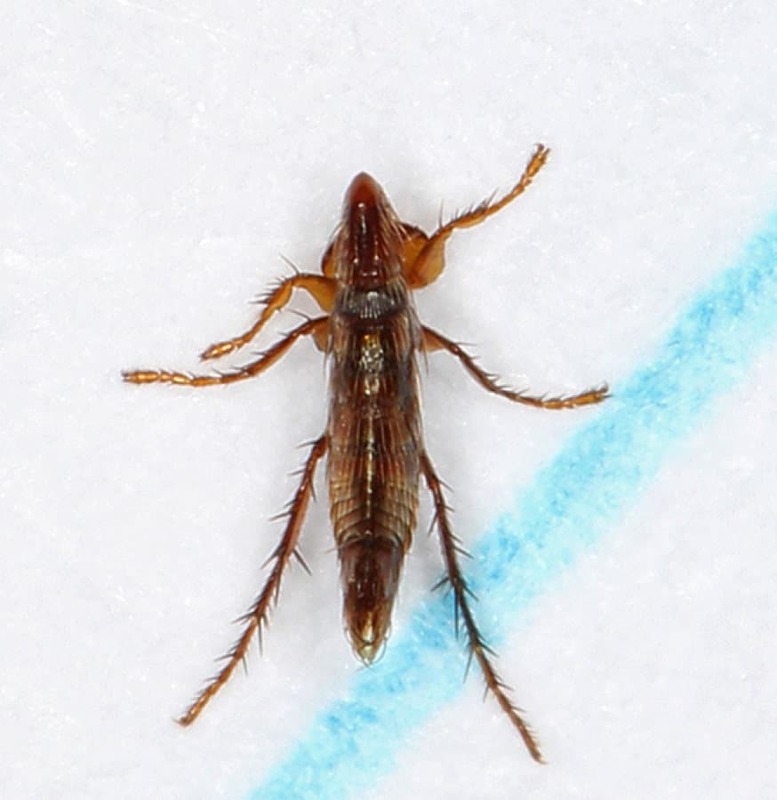 When out walking, fleas can leap up and attach themselves to your clothing. Also, fleas and flea eggs or larvae can be present in second-hand furniture or toys which you have picked up and brought home. Sometimes, you may have suffered the misfortune of moving into a property which had fleas when you arrived. 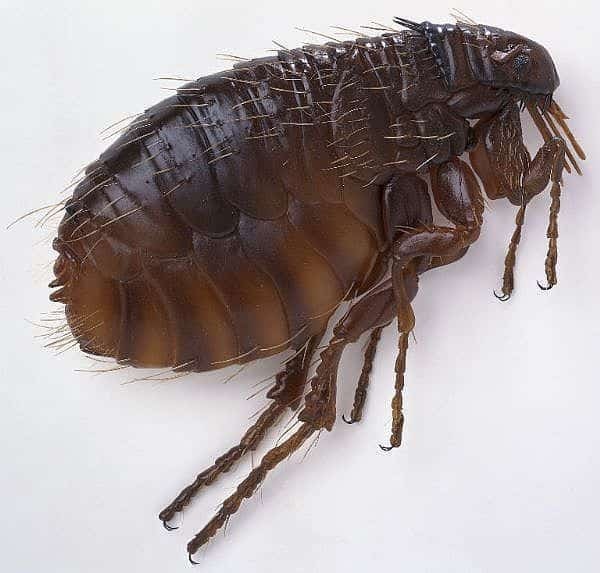 If a previous owner had a flea infestation, these fleas can stay in their pupal state for many months, waiting to sense movement from a potential host. The vibrations from people and animals moving in the property will awaken them and they will quickly hatch. This is a particularly unpleasant surprise for any new homeowner, so it is wise to check if a previous resident had pets before moving in. As we’ve seen, while these nasty pests can reach great heights for their size, fleas most certainly cannot fly. Instead, they are simply supremely skilled at leaping due to their specialized bodies which retain some of the key anatomical features found on flying insects. This lack of wings does not make the flea any less annoying. They are still very difficult to get rid of once inside the home. 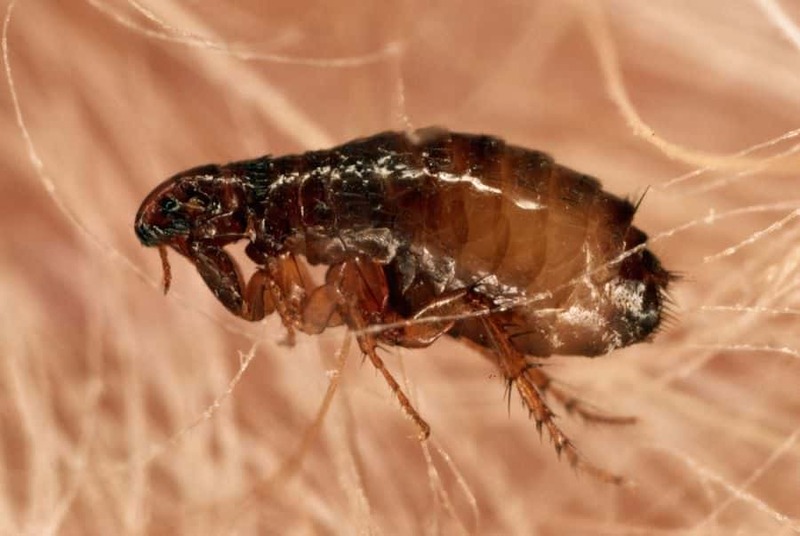 Fleas cause intense irritation and discomfort to our pets and will not hesitate to bite people either. The best way to defend against fleas is by understanding their secrets. And knowing that fleas are incapable of flight should help you feel more prepared to destroy the little bloodsuckers once and for all.